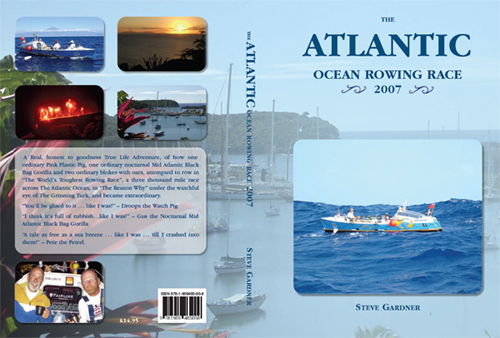 A Real, honest to goodness True Life Adventure, of how one ordinary Pink Plastic Pig, one ordinary nocturnal Mid Atlantic Black Bag Gorilla and two ordinary blokes with oars, attempted to row in “The World’s Toughest Rowing Race”, a three thousand mile race across The Atlantic Ocean, in “The Reason Why” under the watchful eye of The Grinning Turk, and became extraordinary. “A tale as free as a sea breeze . . . like I was . . . till I crashed into them!” – Pete the Petrel.